Many people believe that music theory is hard. Students go to any lengths to avoid having to learn to read music when, in fact, learning how to read music is quite easy if you go about it the right way. Actually, most musical theory is quite easy once you know how! This site is designed as both a reference and a teaching tool. As the various sections develop you will find easy-to-understand explanations of theory concepts, lessons on how to read music, downloadable sheets and short quizzes to make sure you have understood the various concepts. "...music theory is quite easy if you go about it the right way"
The theoretical side of music is an important part of learning to play an instrument. Knowing how scales are put together; how to form chords, and how cadences, modulations and the cycle of 5ths work make a huge difference in the quality of your improvisation and composition in any style. Knowing how to read music fluently, how to spot the key of a piece quickly, what all those Italian and German musical terms mean make learning pieces much faster and make sight-reading much easier. Knowing how to form chords and develop harmony can make the difference between composing an average piece and a great piece. And most exam boards who offer practical exams require you to pass a music theory exam before you can progress to the higher grades. Don't Be Scared Of Music Theory! It's actually quite easy once you get the hang of it - and this website is here to help you do that! Check back often and find out what is new to learn and apply to your playing. As for fun...well, quite a few people argue with me about that - but once they begin learning the concepts and see how they all fit together most people agree it can be fun...not as much fun as Disney World maybe...but still fun! Update September 2014: After starting this site l began a job as Head of Music in a new school and unfortunately didn't have time to continue building the site...I'm now back on the case so Bookmark the site or subscribe to the RSS feed in the Nav bar on the left to keep up to date. I have also been writing a book which you can see more about below. I have taught class and instrumental music to school students from 7 to 18 and to adults. I also run a website about how to practice more effectively - Essential Music Practice. Check it out and supercharge your practice as well as your theory! 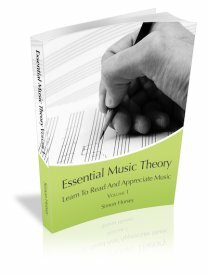 Read about Essential Music Theory Volume 1: Learn To Read And Appreciate Music, the interactive music theory book. Learn to read music from scratch. Complete lesson on how to read music notes for music theory beginners, whatever instrument you play, this is the page you need. When learning how to read music it is important to know the duration of each music note. This page helps you learn the different note lengths, note names, and how they are related to each other. Many people know of the treble clef, but the music clef comes in other shapes as well. This page teaches you about how a clef affects the notes on the staff. The grand staff is used for writing piano music and short scores but it is also one of the best ways to learn to read music. This page helps you to learn the notes on the Grand Staff. This is a page where you can ask music theory questions and, hopefully, have them answered! Many people find it difficult to remember the number of sharps or flats in music key signatures. Here are a couple of easy-to-use methods to help you. Confused about minor key signatures? This page will tell you how to work out minor key signatures easily! Once you know how to work out music intervals it is quite easy, although many people seem to struggle with the concept. Read on to learn how to work out music theory intervals. Working out a music interval is often seen as difficult, but if you follow a few simple steps you can find if an interval is major, minor or perfect. This page focuses on that quality of the interval. On this page you will find blank manuscript paper in lots of different sizes, ready to print. It has lighter staff lines than some free blank music paper so it is easier to see your music writing! This is the blog of the Essential Music Theory website with all the latest info and reviews from the site and other theory-related info as it happens!